I took advantage of a window of free time to get up to a backyard backcountry zone that I frequent in Odgen, Utah. I live near the base of a trailhead that gets me access to skiing these ridges with just an hour and a half hiking on a trail. There is also pretty easy access from Snowbasin, but when my schedule requires much earlier starts I often tour this zone from Ogden City access. The Northern Wasatch has been getting some storms to stick recently so I hiked up to see how things are setting up. ^Mt. Ogden is just starting to hold the snow. Earlier storms melted off pretty quick on the west face of Mt. Ogden. However, it seems this one is going to stick. The forecast of cold temperatures, and another significant wave of storms coming in, leads me to believe this will be our basal layers moving forward now. I like to try and get a feel for it as best I can each fall as winter moves in. ^This particular micro-zone is a new project of mine. 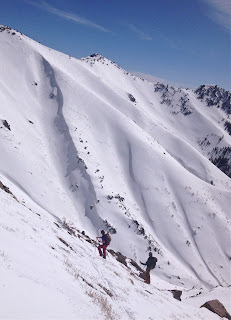 As the Ogden Wasatch gains more attention and traffic some folks talk about the backcountry starting to get traffic, but that is just crazy talk. Compared to almost any other western ski town and resort area Ogden's backcountry is still among the loneliest I have seen. Hence why I still call it home. This zone pictured is pretty low in elevation, but it does get skiable and almost no ever… ever, goes in there to ski it. The runout is pretty terrain trappy, but not nearly as much as I originally thought after my scout on it this time around. ^Two whole ridges of open bowls, chutes, steep and mellow glades. Plus, very little traffic. Just how I like it. Although these areas are indeed seeing a little more attention these days, it is still a gem. The vertical isn't huge, and the shorties are pretty short. However, for me that is actually a plus. I can get to it quick. I can ski short mellow glades on heavier avalanche days, and I can go as big as I want on safer avalanche days. I can spin a few short laps in the morning and skip out of there quick, or spend a long day linking up the ridges for a marathon day if I really want. The variability is exactly what I look for in an "everyday" kind of backcountry zone. The up-trail into the base of the area does cross through some moderate avalanchable slopes. The good news is the slopes are heavily treed and vegetated all the way to the ridge in as low an elevation access point as possible in the zone. As usual in up-tracks, it has some risk. However, as up-tracks go, it is a pretty safe one. In early and late season it is usually dirt for most of it also. 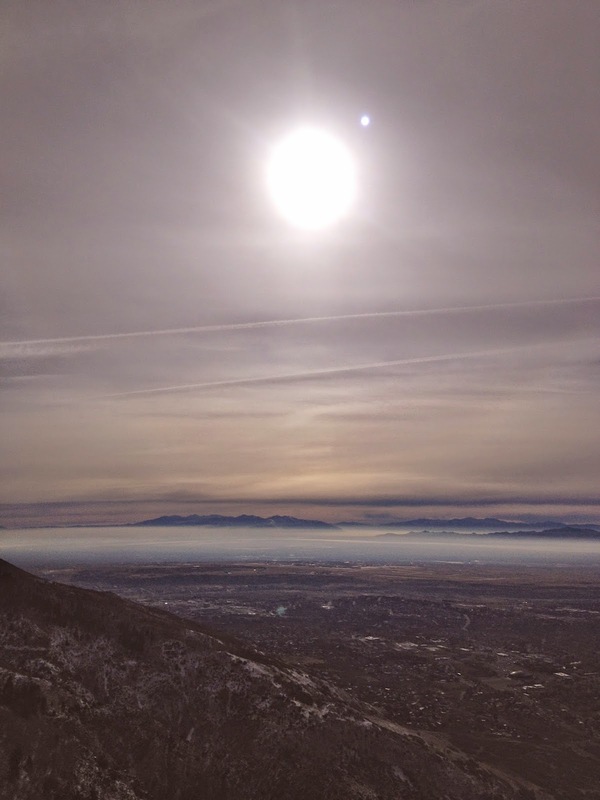 ^The views over Ogden City are pretty sweet too. The snow is definitely enough to stick to be a decent basal layer for the season. I have had better and definitely had worse plenty in recent years. I am hoping to get up to this spot again after this next big storm, but we'll see. My son Amos is fighting a rare form of Leukemia. We go back into the hospital for his bone marrow transplant round at the end of next week so I may not get the chance. I want to try to keep this website about my skiing adventures more then my adventures in childhood cancer. I maintain a different site for that stuff. Hence why there has actually been few posts here this fall. I have been pretty wrapped up in the war against cancer with my youngster, Amos. However, obviously there is no way to completely leave it out of reporting on what I am doing in my skier's career and lifestyle. We are back home in Ogden right now, which is why I am even able to get a chance to get out in this zone. I am glad I got up there to see the start of the snowpack though. I do plan to spend plenty of time in there again this winter. Amos is gonna win his battle in this veritable storming of the cancer castle that is this bone marrow transplant round of treatment, and come mid-January he is gonna be on the road to recovery in remission. This is the mindset I have to take. Positivity with certainty. So I will scout accordingly. Just as I always do any other early season start to winter. If nothing else this terrain and snowpack scouting mission gave me a chance to get up high above it all, some good exercise, and a chance for a few deep breaths. I am not gonna manage a whole lot of time in the mountains while I am in the midst of the month and a half long battle fighting behind my young son in this transplant round. So I will do my due diligence when and while I can in order to be ready for when Amos beats cancer with plenty of winter to spare. Sometimes life comes at ya. That is when ya gotta take a deep breath, and get down to it.